YIIK: A Postmodern RPG will be important to somebody — with several somebodies being more likely. It’s the sort of game that will gain a cult following. These super-fans will appreciate its millennial dread, imperfect friends supporting one another through crises both personal and apocalyptic, and a quirky style that draws on gamer culture, weird horror, and low-poly goofs without getting bogged down in uncritical nostalgia. This hypothetical cult, which will wear cut-offs under their ironic robes and hold seances with the wildest tunes, will readily forgive YIIK its typos, bugs, and padding. While the game can be completed in under thirty hours, it would be right and good to be able to spend less time in battle and more time with the characters in their messed-up, hipster David Lynch world. Since YIIK mentions postmodernism in its title, it’s just asking to be dissected by critics, but it can also be enjoyed uncritically as a mystery. The story begins with bearded, beflanneled Alex returning home from his fifth year of college, liberal arts degree in hand. He’s big on ego, but short on human empathy. As Alex and his possibly imaginary panda bear, Panda, become reacquainted with his hometown, Alex meets Sammy Pak, a woman who lives underneath a factory that’s been converted into a hotel. What he sees next may shock some, but ‘90s kids already know! 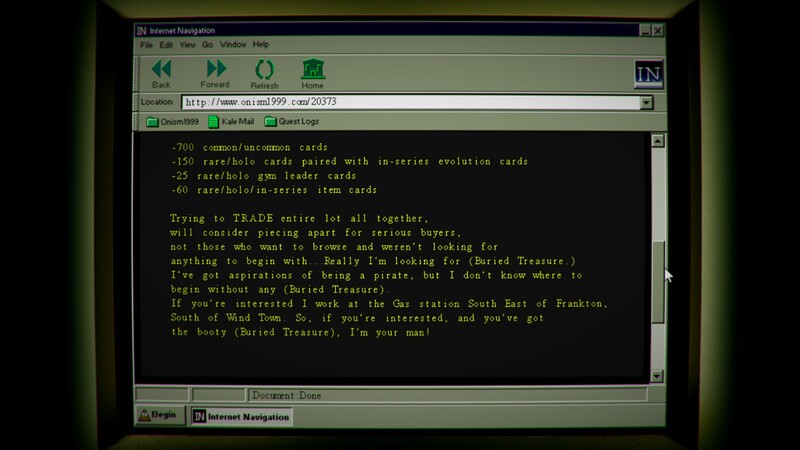 Soon, Alex is drawn into the shadowy world of Onism1999, a message board dedicated to unsolved mysteries and metaphysical paranoia (as well as some good old-fashioned online jackassery). Alex is rude to Sammy’s cat. Bad move, jerko. The game is postmodern in the literary sense, which is to say it isn’t weird for the sake of being silly or pretentious. The game is silly and weird, but it’s in the service of character growth, the greater mystery, and its unorthodox conclusion. Many of YIIK’s postmodern techniques — pastiche and collage from games like Super Mario Bros., Shadow Hearts, and Ackk Studios’ own Two Brothers, intertextual commentary on modern interpretations of the hero’s journey, metafictional reflection on video game conventions and message board culture, and constant interrogation of the limits of subjectivity — are familiar. It doesn’t take a gamer familiar with Scott Pilgrim, the works of Haruki Murakami, Earthbound, the Persona series, or Welcome to Night Vale, all of which share common DNA with YIIK, to recognize an attack on the fourth wall or characters experiencing anxiety within an out-of-control culture of commodification When taken independently, these techniques are generally too commonplace to be recognized as postmodern, but YIIK effectively combines them to demonstrate the alienation, juxtaposition, and sense of play that define the style. Speaking of style, YIIK has it in spades. The bright, low-poly graphics evoke the 64-bit ‘90s and, when combined with the strong voice acting, contribute to atmosphere of alienation. Hearing such honest, relatable voices coming from its chunky, metaphysical wanderers keeps it surreal. Depressed scenester Rory (Andrew Fayette), hopeful otaku Claudio (Anthony Sardinha), and cool, weary Vella (Melanie Ehrlich) stand out as characters who balance the story’s stranger moments with the verisimilitude of their lines. Andrew Allanson and friends keep the score with a diverse soundtrack that includes poppy earworms, electronic jams, and atmospheric nightmare tracks. Other parts of the interface draw from earlier generations of RPGs, including menus that wouldn’t be out of place in a 16-bit world and blocky sprites for the overworld and the occasional mini-game. Ackk Studios feels invested in celebrating its creative predecessors, even while the game has a more nuanced take on their cultural impact. The atmosphere of subtle alienation really pays off when the player gets a look beyond the curtain. The full answer to the mysteries of Sammy Pak and Onism1999 aren’t revealed until the end — if even then — but every scrap of the world beyond normalcy revels in New Age imagery and skyscapes crossed with bodies ripped from Japanese horror. Instead of leveling up like the heroes of games he’s played, Alex travels into a dungeon inside his mind to confront its residents and assign stat points. Parallel to his mechanical growth, he slowly, painfully becomes a better person. On the downside, YIIK’s reliance on brief peeks behind a cosmic curtain obscures several areas that could use further illumination. We’ve all been here, buddy. Alex’s quest takes him through towns, dungeons, and other stock RPG locations. The starting town of Frankton and several of the dungeons are sprawling, lively places, but not all locations have the same spark. Although there are a few side quests, they’re straightforward. Most of them consist of traveling to a location and defeating a non-unique monster or delivering an item to someone who needs it. During his travels, Alex gains several overworld abilities like zooming on a skateboard and stylishly flipping his hair to cut down bushes. These abilities typically gate treasure or add texture to dungeons, but there are a few puzzles that require using them creatively to flip switches or navigate a maze. Combat is a creative visual treat, but it’s most fun in small doses. Battles are turn-based with standard commands to attack, defend, run, use an item, and swap party members. However, most abilities trigger a unique, timing-based mini-game. For example, in a mini-game reminiscent of Super Mario Bros. 2, Vella has a limited amount of time to pick up her bass amp and drop it on a moving enemy. Claudio’s bokken kata requires the input of a lengthy series of button presses (that start out awfully familiar). The further the player gets in the sequence, the more powerful the attack. The mini-games start out challenging, but repetition makes them familiar. Early in the story, Alex gains Time Control, which the player can use to temporarily slow down combat for more impressive combos, but it’s a limited resource unless Assist Mode is enabled. The variety of mini-games and spectacle makes battles a lot of fun at first, but they drag on for too long. Defending doesn’t have nearly the variety as attacking, enemies have far too many HP, and most enemies (including bosses) draw from the same pool of generic attacks. Tactically, combat follows the familiar pattern of many RPGs: use the most powerful attacks, heal, and regain Power Points when necessary. Thankfully, there are a limited numbers of battles per map. Beyond speeding up combat, especially later in the game, YIIK would also benefit from a few technical tweaks. Although the dialogue is sharp and explores the human side of anxiety, alienation, ego, existential despair, and responsibility, it suffers from many capitalization and grammar issues. More concerning, there are several easily encountered bugs, some of which cause the game to lock up. Less critically, the inventory screen would benefit from automatic sorting or multiple tabs. Healing items are a big part of combat, and having to hunt for snacks that are hidden beneath a stack of t-shirts and hula hoops can make long fights even longer. Sewer dungeons were much nicer way way back in the 1990s. 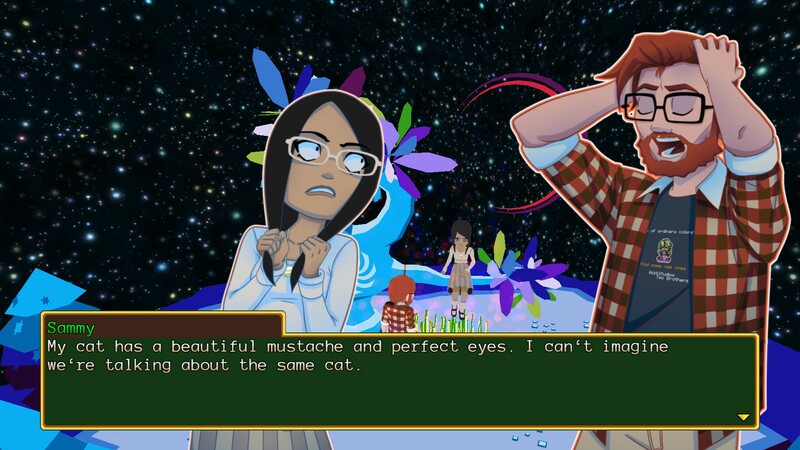 As with most mysteries, even postmodern genre-benders, YIIK’s central mystery has a conclusion. The final leg of the story progresses in a bold direction; even saying this much could be construed by some as teasing spoilers. Anyone invested in a conventional ending may feel betrayed. Even players who enjoyed the entire ride may find themselves wondering. In other words, there are plenty of hooks for anyone interested in theory-crafting or diving deep into the story’s implications. While there is a New Game+ mode, it doesn’t offer much new material beyond a few scenes in the Mind Dungeon. These scenes would make a great setup for more story, but instead feel perfunctory. 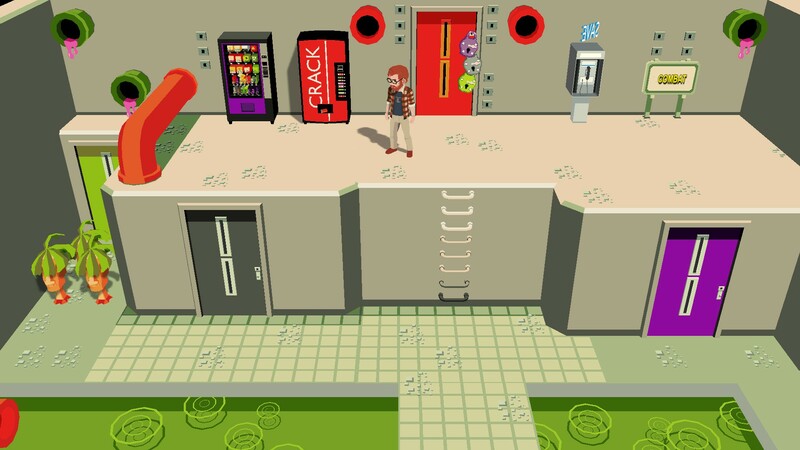 Despite concerns about the battle system and general interaction, YIIK is well worth a look. In under thirty hours, it introduces a cast of characters and an uncaring universe that use a poppy, hallucinogenic ‘90s to speak to contemporary issues, bounce off games past, and just hang out, man. The narrative takes risks with the later acts and Alex’s unlikeability, but if it clicks it’s potent stuff. The audio/visual experience works exceptionally well for this mood, elevating YIIK into the ranks of games that may not be for everyone, but will be there for someone who needs it. Come for the surreal take on contemporary Americana, stay for the chill music, and maybe even learn something. Zach Welhouse has been working for RPGamer since 2008. He writes reviews and covers the occasional convention.